With its record-setting budget, box office, and Oscar haul, the 1959 Charlton Heston version of Ben-Hur is the one that gets all the attention. But this week's new incarnation, with Jack Huston in the title role, is actually the fourth time that Lew Wallace's mega-bestselling 1880 novel has been adapted for the big screen. The first one, a 15-minute production from 1907 (which you can watch below), had little impact on movies as an art form, but the lawsuit it inspired changed the business forever: It established that you can't turn a book into a movie without permission. Well, duh, you say, in 2016. But cinema in 1907 was like the internet in 1997: an untamed wilderness, waiting for the law to catch up. Movies were so new that the word "movie" didn't exist yet (the first known usage was in 1911), and motion pictures were just starting to be shown in venues built for that purpose, instead of in vaudeville houses, convention halls, and such. So when an upstart movie studio called the Kalem Company set out to film certain scenes from Ben-Hur, they didn't bother to get anyone's permission. Nobody did in those days; the nickelodeons were full of unauthorized one-reel adaptations of plays and novels. But Ben-Hur attracted special attention. Not counting the Bible, the book was America's all-time bestseller, and it had been translated into 20 languages. An authorized stage version opened on Broadway in 1899 and would play for more than 20 years, seen by some 20 million people. The movie was viewed as direct competition. The Kalem Company, having sought permission from no one, was sued by everyone: publisher Harper & Brothers, who owned the Ben-Hur copyright; Marc Klaw and Abraham Erlanger, theatrical producers who owned the rights to the stage version; plus, for good measure, Lew Wallace's son. The law forbade unauthorized "printing, reprinting, copying, publicly performing, or representing" a copyrighted work. In court, Kalem's lawyers argued that since the movie was just a series of photographs without dialogue, it didn't count as "performing" Ben-Hur. The plaintiffs' lawyers emphasized the "or representing" part of the statute, countering that surely something titled Ben-Hur, featuring actors pantomiming famous scenes from Ben-Hur, constituted "representing" Ben-Hur. 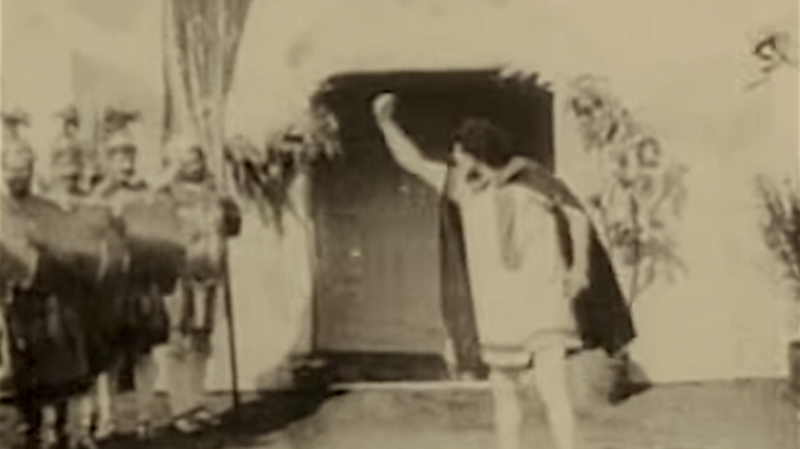 In 1909, it took 100 words to say that Kalem "made a movie." And the appellate court's preferred term for the venues where moving pictures were exhibited? "Theatoriums." The Kalem Company reached a settlement of $25,000 (about $650,000 in 2016 dollars)—a large sum, but not enough to sink the company, which continued to do healthy business until it was sold to Vitagraph Studios in 1917. More importantly, a precedent had been set. Studios then in the process of adapting plays and books scrambled to get the permission they now needed, and all future productions would have to do the same. So if four Ben-Hurs seems excessive, consider how many there would be if filmmakers didn't need permission to make them.